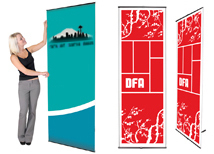 Non-retractable banner stands are great solutions for store fronts, marketing events, and farmers markets. They are very affordable and have many features including adjustable height and multiple graphic options. We offer the most popular spring back, telescoping, and ridged pole banners at very low prices. There are no set up fees or administrative fees and every banner comes with high quality anti-curl vinyl! 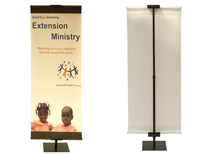 The EZ Extend Banner Stands are a stretch fabric banner stand. There are multiple sizes available so there is one for every event! Spring back banner stands are the lowest cost portable banner option. 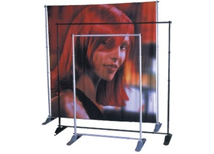 They are very lightweight and easy to assemble making them ideal for trade shows! 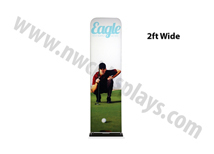 Ridged pole banners utilize solid base supports for an attractive look. They are very stable and perfect for retail stores and universities! Non-retractable banner stands are banners that do not have the retractable feature built in. There are many different styles of non-retractable banner stands that can offer many advantages over retractable banner stands. Non retractable banners are ideal for semipermanent displays in store fronts or event halls. Since there is no retractable mechanism they can often be more reliable and easier to transport. There are many different styles of bases making it easy to find a banner that will look great in any location! Adjustable size banners are great when a company is looking for a highly versatile stand that can conform to nearly any booth size.